Sales kicked off last Thursday, July 18, for 2013-W Proof American Platinum Eagles. Newly released figures from the United States Mint show collectors ordered 2,139 by Sunday. That is the weakest start for the series of 99.95% pure platinum coins. Collectors have commented favorably on this year’s design (read the news article about its release), but swinging precious metals prices has inserted at least a touch of buying caution. This year the one-ounce Platinum Eagle opened at $1,800. Last Wednesday the price bumped up $50 from what it could have been when the average for platinum moved higher to between $1,400.00 and $1,449.99 an ounce. Before then, there had been downward pressure. The price of the Platinum Eagle will not change this week with platinum firmly within the same price-setting range. And with the coin’s 15,000 mintage limit, there is no rush to buy. Collectors can patiently wait to see how platinum plays out. 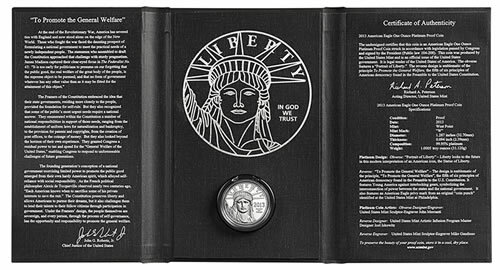 The 2013-W Proof American Platinum Eagle is fifth in the six-year "Preamble Series." Its reverse design features the theme "To Promote General Welfare." It may be ordered from the U.S. Mint’s online page or by calling 1-800-872-6468. In other coin news, there is a chance that the U.S. Mint on Wednesday will raise prices on its range of numismatic gold coins. Current prices are based on an average of gold that is within $1,250 and $1,299.99 an ounce. London fixings on Wednesday must still be considered but the average is sitting at $1,305.72 an ounce. If Wednesday’s AM Fix for gold is above $1,254.20 and the PM Fix is at or above $1,300 an ounce, then the U.S. Mint will increase gold coin prices by $50 for every ounce of gold content. When pricing adjustments are needed, the Mint tends to carry out them at around noon ET. Coin News Update: The U.S. Mint increased prices Wednesday for its numismatic gold coins. Platinum coin prices remained unchanged. Nice coin, but with the volatility in the metals market, I think I can nab one of these for $1650 or so……and they’re not going anywhere at $1800 per. To recap – in 2009 these debuted at the same price they are today in 2013; as I explained above, the problem has nothing to do with the price (it still soldout in 2010 at 1900 dollars for each of the 10,000 they sold in a sell out on the heels of the success of 2009), but rather the problem is the bloated greed-induced mintage. It can never be said enough: DON’T MESS WITH SUCCESS; leave the mintage LOW – it creates sellouts! The US Mint is not in the business of creating rarities. The collector products they sell is to satisfy collectors, not feed a profit motive. Furthermore, you should be blaming all the complainers from the 25th ASE set, early FSQ releases, the 5oz ATB fiasco, etc, not the US Mint. If you ever complained to the mint because you couldn’t get a sold-out product, then you’ve contributed to the issue. From the mint’s point of view, they are only fulfilling the demands of the citizenry. The Mint knows it slow; they are about to have free shipping. Really? I’ve been pushing for that in their surveys, etc. At least for subscriptions or totals greater than $100 anyway. I hope it happens. As an aside, I do believe that the large coin companies, such as gainsville coins or hill-whatever they’re called have some kind of technology to attach themselves to the Mint servers and block out others until their orders are placed, on top of the preference of having T3 lines or better to be able to get in ahead of lowly bandwidth customers. So when I said the 25th AE set was in fierce competition my point for an unannounced release date was proven: if no one knows when it comes out then they cannot change their schedule to be able to camp out and prepare all their monster machinery to try a takeover of the Mint ordering system and crank out all their orders before everyone else can get theirs. By keeping the release date a secret a la the 20th anniversary AE sets, the coins are available for longer because of the above explanation. THUS, the Mint SHOULD keep their special sets a secret. On top of all this, they ought also to make good products, like a SILVER PENNY! 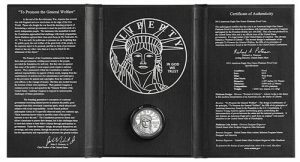 This would be part of an ALL-SILVER annual proof set (everything: dollar coins and penny and nickel). Make it available for under $100 and it would be the bestseller of the year. Make the mintage a maximum of 500,000 but do not reveal the maximum mintage (stop it on a random number like 413,774), that way no one knows and then suddenly it sells out, contributing to great value later on. This is just one of idea of many that would make the products at the Mint far more collectable. And for all who would complain about a sellout – you had just as much chance as anyone to get it. It would be like complaining about the price of a stock going high after you didn’t buy it low and saying it isn’t fair. Did everyone on here get enough West Point 2-coin sets? And yes, your comment that their premiums are high is true – they have systemically raised prices across the board; anything from 300% on clad coins to 50% on the silver and gold coins. The price increases are ridiculous of course, and they have seen their sales fall as a result, and for a while they have tried to just keep raising prices to offset the lack of customers while offering nothing better on their products or justifying any kind of price increase from higher costs or something (even if they did go down this road we’re only talking a 10% increase at most for that). Bottom line, until they bring the prices back down to Earth like they were in 2007 or so, they will continue to have people stay away from their products and their sales will continue to plummet, just as they have every single year since 2007. Jim – Begins Friday 9am EDT; wait a day to buy your puck if you dont think it is going to sell out tomorrow with all of this new found interest in “collecting”. re: “collecting” – I wonder how many real collectors are out there and how many are dealers or speculators. My guess: the collectors are way outnumbered. I do wish they would change the packaging for this coin and put all the text in a little pamphlet to be included in a much smaller box. Agreed but they sure crank out a lot of bullion as well. 28 million plus silver AE’s so far this year for “collectors” and still going strong? Are you collecting one of these at that mintage? or speculating? I take solice in knowing there are a lot of upside down people here; doubling down I guess these days. Guess I just dont like the fact that the mint can sell a product that the so called ordinary person can not buy directly. And yes, just joking; I really meant “speculating” and not “collecting”. Seems to be driving this show. Tim B – bullion coins aren’t really a collectors paradise. I am not even a fan of seeing them graded and sold at a premium… since at the end of the day they are bullion and millions are made as you point out. Agreed, there is nothing unique about bullion coins. At least those with a W mint mark are usually limited to 850,000 or so – still a large number if scarcity is desired. The bullion coins were not initially issued for collectors but for investors. The uncirculated bullion coins were issued to coincide with new laws allowing individuals to hold gold and silver bullion in their 401(k) retirement accounts. These coins were initially issued for investors and retirement funds and it was not until Coin “Grading” that Bullion coins became visible to Collectors!